If you want something really special for your next holiday, why not consider North Africa as a destination? With this New York to Tunis flight for $755 r/t – including taxes – you can discover the best bazaars and secret alleys of the ancient capital of Tunisia. Travel in November and save on your airline ticket with Turkish Airlines. Search for this cheap flight to Tunis on Travelgrove, as that is where we have fund it, but note that it was originally provided by Faredepot. If you are a wise traveler you will also compare the rates of some other merchants from below – maybe one of them has a cheaper flight! If you book this airfare deal you will depart on November 17 from John F. Kennedy International Airport (JFK) and fly back 8 days later from Tunis – Carthage International Airport (TUN). There is a stop in Istanbul both ways, first a 2 hour 55 minutes one then a 11 hour 25 minutes one. 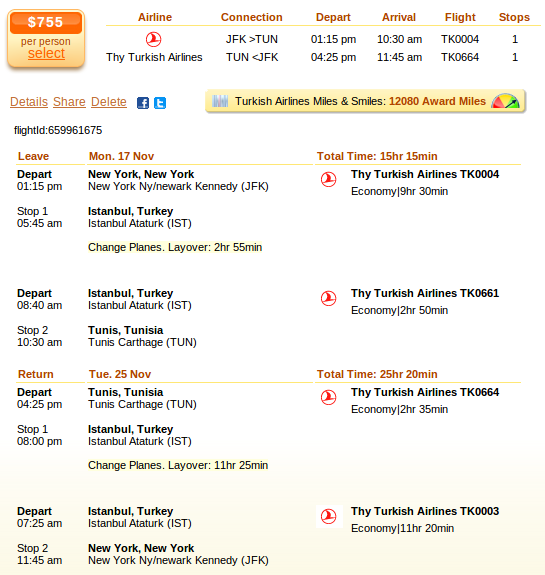 For booking this flight Turkish Airlines Miles and Smiles will provide 12,080 award miles. Turkish Airlines’ offer is $76 cheaper then even the next best flight deal, a multiple airlines flight that costs $831 r/t. See the best offers for yourself in the table and search for them in the box above. This entry was posted on Tuesday, October 28th, 2014 at 3:13 am and is filed under Airfare Deals. You can follow any responses to this entry through the RSS 2.0 feed. You can leave a response, or trackback from your own site.